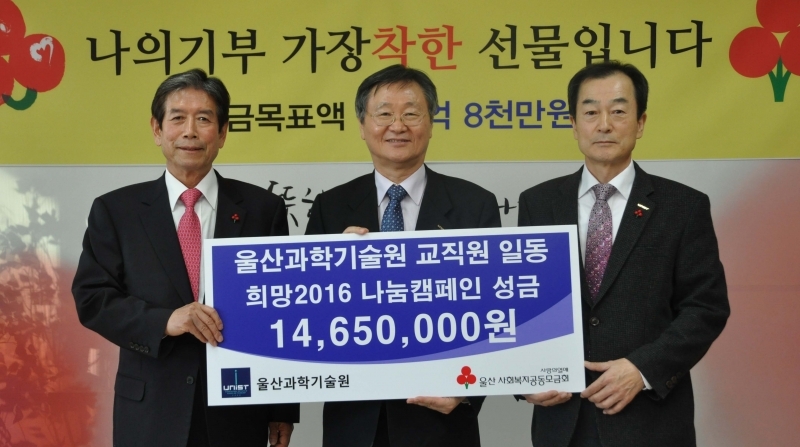 UNIST visited the Ulsan Community Chest of Korea to deliver KRW 14.65 million ($12,506) of donations for the needy. Spreading holiday cheer while offering help and support to the needy in Ulsan. On December 17, UNIST visited the Ulsan Community Chest of Korea’s headquater to deliver KRW 14.65 million ($12,506) of donations for the needy. Prof. Jae-Sung Lee (Vice President of Academic Affairs of UNIST), Mr. Kyoo-hwan Kim (Administrative Director of UNIST), and Sang-Man Kim (President of the Community Chest of Korea) were among the attendees at the donation event, held in the Ulsan CCK building in Ulsan. UNIST has been donating collections annually since 2006. This year’s donation was collected from the staff, faculty, and members of UNIST to offer help and support to the needy in Ulsan.